Sometimes I just want to poke at a HEX file quickly and make sure it contains what I think it should. 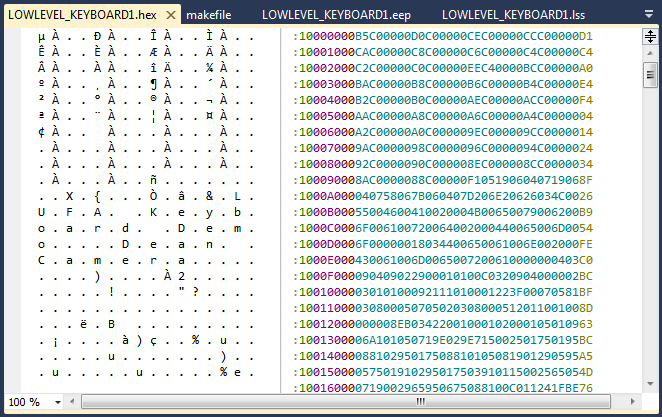 To aid this, I developed in collaboration with my friend Morten a simple Atmel Studio HEX/SREC file classifier, which highlights the various parts of the HEX/SREC file entries (address, data, checksum, etc.) and provides an ASCII extraction of the record data. When installed, the extension will automatically color any EEP/HEX/SREC file that is opened with a basic (configurable) color scheme and show the ASCII representation of each record's data section.